Most of the pesticides currently in use have caused serious social and environmental repercussions. Insecticides derived from plants are ecologically desirable and economically advantageous. More than 2,400 plant species possess pest control properties. Scientists learned about the pest-control properties of plants by observing practice of traditional farming societies. The ancient Romans used false hellebore, veratrum album, as a rodenticide, and the Chinese are credited with discovering the insecticidal properties of Darns species, Pyrethrum was used as an insecticide in Persia, likewise tobacco plant preparations have been used for nearly two centuries. The nicotine-rich water has often been applied to plants in the Middle East as a crop protection measure. Nigerians have been using neem leaves for the control of stored grain pests. Among 267 plant species used for pest control in China, aqueous extracts of Tripterygium wilfordii are sprayed to control caterpillars, tussock and pine moths, and mustard, melon, and rice leaf beetles; powdered roots of Stellera chcmaejasme are mixed with top soil to control soil pests; and dried leaves of Melia azadarach are placed between the mat and supporting board of beds to control lice and fleas. In the Indo-Pakistan sub-continent some of the medicinal planes namely 'Sweetflag' Acorns calamus "Kuth" Skimmia laureola " Mushkbala" valariana officianalis and "Ner" Skimmia laureola are frequently used in the northern hilly areas as insect deterrents. Articles placed in baskets of sandalwood, Santulum album, are immune to insects. Dried leaves of fenugreek, Trigonella foenum-graecum, are mixed with stored grains as insect repellent, especially during the rainy season. It is a common practice in India and Pakistan to apply turmeric powder, Curcuma longa, to stored "Basmati" rice for protection against the attack of insects. Pakistan sub-continent and Africa. In Pakistan, fresh neem leaves are mixed with grains or these arc rubbed against the inside walls of mud bins. Sometimes the water extract is applied to [he gunny bags in which grains are to be stored. In India, dried neem leaves are spread in 5- 7 inch thick layer in grains. Neem is very widely distributed on the globe, especially in the Asian, Middle East and African countries. It is known as neeb in Arabic, neem in Hindi and Urdu, azad dirakht in Persian, and nimba in Sansikrit. It is a fast growing tree which can be established without irrigation in hot and dry regions of the world. It is native to Indo-Pakistan sub-continent. In South Asia, it is also found in Bangladesh, Upper Burma and in the drier parts of Sri Lanka. In Southeast Asia, it occurs scattered in Thailand, Southern Malaysia and in the drier Indonesian islands of Java. It is also found in the northern plains of Yemen and has been recently introduced into Saudi Arabia. In Africa, it is particularly widespread in Nigeria. growth-regulating activity- The work on the pesticidal activity of neem liminoid, later identified as Azadirachtin, opened up a new era of renewed research on neem as a source of biopesticies. Neem products are unique, being not outright killers of pests. Instead, they alter an insect's behavior of life processing ways that can be extremely subtle. Eventually, the insect can no longer feed or breed or undergo metamorphosis and, hence, cannot cause Further damage. use, but it is useful for household use. of Phytophagous coccinellids (Colorado potato beetle and others), arc also sensitive to neem products. They refuse to feed on neem-treated plants, grow' slowly and some (such as soft-skinned larvae of the Colorado potato beetle) are killed on contact, from various field trials on moths, it appears that larvae of most lepidopterist pests are highly sensitive to neem. In the Philippines, plots treated with neem cake had lower incidence of ragged stunt and tungro viruses. In field trials conducted in India, neem treatments were found effective against populations of green leafhopper, Nephotettix virescens, yellow stem borer, Scirpophaga incertulas, rice gall midge, Orseolia oryzae and grasshoppers. azadirachin, produced 100 per cent mortality. In the Dominican Republic, water extract of neem seed proved effective against Aphis gossypii on cucumber and okra and against Lipaphis erysimi on cabbage. Neem extracts are also effective against gyp5)" moth, horn flies, fruit flies and mosquitoes. Birds and fruit bats consume the sweet pulp of the neem fruit, bur not the seed. Birds given aqueous extract in diet looked sluggish soon after and some of them later died. 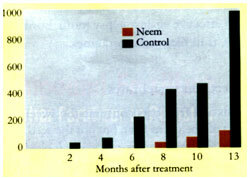 Aqueous extract of young neem leaves fed to rats and rabbits showed a marked drop in blood glucose. butterflies, and other insects, such as bees that pollinate crops and trees, ladybugs that consume aphids and wasps that act as parasites on various crop pests. insects that feed on plant tissues succumb, while those that feed on nectar or other insects hardly accumulate significant concentrations of neem products. deterrent. Azadirtin is structurally similar to insect hormones called "ecdysones", which control the process of metamorphosis as the insects pass from larva to pupa to adult- On an average, neem kernels contain 0.2-0.4 per cent azadirachtin. In addition to this, meliantriol, salanin, nimbin, nimbidine and many other biologically active components have been reported in neem. Dr. Gb«lam}il3ni is Director/'Prnciple Scieatific Officer, Integrated Pest Management Institute. National Agrcultural Research Center, Park Road. Islamabad.